We took a Norway fjord drive rather than a cruise along the coast and up some of the fjords. We thought we saw the fjords just as well, and we felt like we saw a whole lot more of the little villages along the fjords. You may have noticed that we like driving trips, and we've done things like this in other places... like Panama for one. Driving through Norway is easy and beautiful. You can choose your own route depending on what your time frame is and what you want to see. That's another thing we like about driving. When you drive your car onto those ferries, you'll practically feel like you're on a cruise, not a fjord drive. We've used this photo before, but we just love it... and we loved the Norway fjord drive! We drove north from Oslo through the middle of the country. Lillehammer - You can go through Lillehammer, a pretty resort town that hosted the Olympics in 1994. Røros - If you want to see a bit more of the interior of Norway, there are national parks you can explore, or you can visit the historic mining town of Røros. Its 18th century wooden houses have been preserved... many now give home to restaurants and shops. Trondheim - We cut over to the coast to see Trondheim. It's a lively and historic university town. You can visit its historic Nidarosdomen Cathedral and museums... or just enjoy the colorful town as a great spot to start your Norway fjord drive down the coast. There are also some ancient rock carvings in the area just north of town. Head southwest out of Trondheim on the E39. The road will take you over toll bridges and ferries. Ferries run fairly frequently, so you won't have to wait long. We stopped at Grampas's home town, but even if so... the scenery is great all along the way, and even while you wait for the ferry. The ferry from Molde to Vestnes will get you on your way to the very pretty town of Ålesund. It has a drop dead gorgeous setting, and the town is a kaleidoscope of colors with its Art Nouveau architecture... all turrets and spires and fancy ornamentation. It's another great place to spend the night on your drive. The drive to the mountain-top lookout to see the town spread out below is a must. There's a cafeteria on top where you can have a beer and enjoy the view. 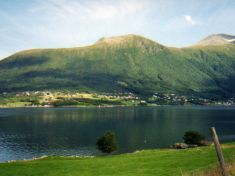 The Geiranger Fjord - Start early and drive along the Storfjorden to Geiranger. The hour ferry ride down the Geirangefjorden is spectacular. That's the Geriranger Fjord in that photo at the top. 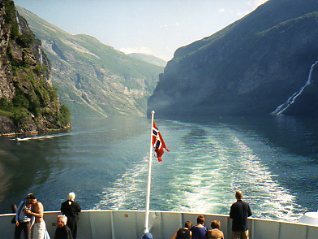 This narrow fjord with its waterfalls is visited by cruise ships and photographed often for tourist brochures.... and it's included in the UNESCO World Heritage List. On this Norway fjord drive, you'll encounter lots of winding roads... so wind your way south through spectacular scenery. I know we keep using superlatives, but Norway demands that. 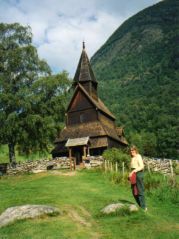 When you get to Sogndal on the Sognefjorden, turn north for a few miles so you can visit the Urnes Stave Church, the oldest wooden church in Norway. It was built in 1150, and is another UNESCO World Heritage Site. Leave the car behind and take a pedestrian ferry, then walk up to the church. 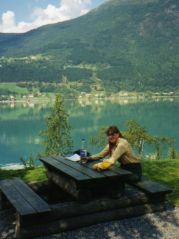 Return to Sogndal and head to Kaupanger where you can catch a really long ferry ride on the Sognefjorden. These ferries don't run quite so often, and because of the long ride, the last ferry is in the afternoon, so check the schedule or be prepared to wait until morning. I have to tell you a cute story here... We almost missed the ferry because we didn't watch the schedule. The ferry had pulled up the loading ramp! Oh no... it was the last ferry of the day. As we arrived, the captain leaned over the rail and called out... "Gudvagen?" We said, "Ya, Gudvagen!" He asked again, and when we said yes, he sighed and lowered the ramp for us. They had started to depart 3 minutes early. Whew... just don't cut it as close as we did! This ferry will take you to Gudvangen via the Sonnefjorden, Aurlandsfjorden, and finally the Nærøyfjorden. That last segment is part of the Norway in a Nutshell tour, so you know it's going to be pretty. There is a hotel in Gudvangen, and there are more a few miles further up the road. Drive the winding road up to Voss. ...Or since this is a Norway fjord drive, you can take the scenic route along the Samlafjorden, an arm of the Hardangerfjorden, before you connect back with the highway to get into Bergen. 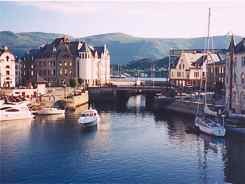 Make arrangements to drop the car off in Bergen, and visit that historic town. You can fly home from there. The bridges and ferries are not cheap, so keep your credit card handy. ...and you can't beat the scenery at the road side tables provided. Language is generally not a problem in most of Norway. English is a strong second language, and you will have no problem getting hotels and meals. Buying your tickets on the ferry can almost always be done in English. 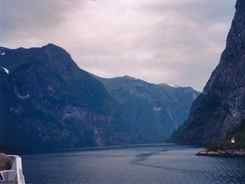 A cruise along Norway's Fjords is great, but you really will see a more intimate view of Norway by taking a fjord drive.